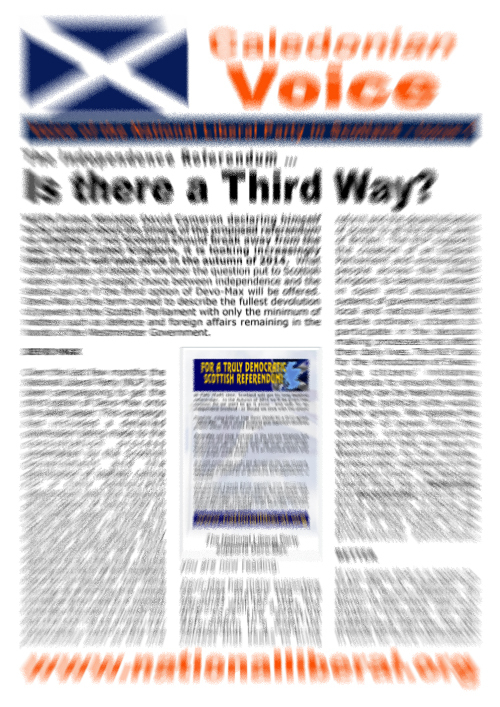 Federalism for Britain: The NLP Launches two papers for England & Scotland. JULY saw the launch of two new publications by the National Liberal Party (NLP), English Voice (EV), and Caledonian Voice (CV). As their titles suggest, the former is produced for England and the latter is aimed at Scottish readers and thus they will function as the national NLP papers for England and Scotland. Both papers are currently produced in a double-sided A4 format with the front page comprising eye-catching mastheads and lead articles with the reverse giving readers a general introduction to the NLP, its policies and its New Horizon e-zine. EV is currently available online while CV is available both online and in printed form for distribution door to door. The common theme of the first issue of both publications can be summed-up as ‘Federalism for Britain’ and revives the concept of ‘The British Family of Nations’ which was a strong strand of de-centralist thinking within nationalism in the 1980’s which sought to strengthen local and regional identities and culture and devolve power away from central government and down to the ordinary people. At the time this represented a radical departure from what had been hitherto orthodox nationalist policy which looked very much to a centralist British Government and a blanket British identity. With the question over Scotland’s future within the United Kingdom and calls for England to have its own Parliament, EV and CV bring a nationalist view to these debates. “The NLP supports the creation of an English Parliament and encouraging people across the United Kingdom to become involved in open and accountable systems of government at both local and national level that enable ordinary citizens to participate in the decision making processes that affect their daily lives. The NLP calls for the introduction of Swiss-style citizens’ initiative referenda to ensure that the majority can be heard on issues that the political elite would rather ignore”. EV then continues to point out other areas where England is disadvantaged relative to the other parts of the United Kingdom, such as the “West Lothian Question”, posed by the Labour MP Tam Dalyell back in 1977, which highlights how MPs from Scotland, Northern Ireland and Wales can vote on purely English matters in the House of Commons while under devolution English MPs could not vote on the same matters concerning those other parts of the UK. 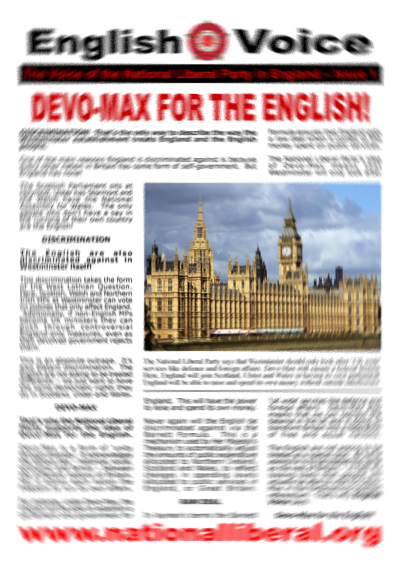 EV puts forward the creation of an English parliament under Devo-Max as the way to address the imbalance with the rest of the United Kingdom. Both English Voice and Caledonian Voice are produced to a high standard with impressive layouts that attract the reader. CV has been produced in printed form with the aim of being distributed especially in small towns and rural areas that do not often see any form of political campaigning. It will be interesting to see what the response is. Readers interested in distributing CV door to door in their areas should contact the NLP’s office for details of how copies can be sent to them. I understand that issue two of both papers should be out before the end of the year. Both papers are also available via e-mail. To get hold of them, e-mail natliberal@aol.com and ask for your FREE pdf copy of Caledonian Voice and English Voice.